This metronome subdivides the beat into three equal parts with a high click on the beat followed by two low clicks. It is great for practicing triplets as well as music that is in compound meter like 3/8, 6/8, 9/8, or 12/8. 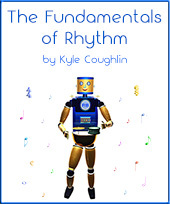 To learn more about time signatures, triplets, compound meter, and rhythm, visit www.rhythm-in-music.com. Practice tips for how to use a metronome. This metronome requires Flash Player. If you do not see the metronome or if it does not function properly, visit the new home of the triplet MetronomeBot, which works on computers, phones, and tablets, or select a tempo below.